What’s next for UFC 232 main and co-main event fighters? Last night, the UFC held its final pay-per-view of 2018 in Inglewood, California and had two titles on the line. For all the negative attention the card got after being moved from Las Vegas to California, it ended up delivering. In the co-main event, Amanda Nunes shocked the world and knocked out Cris Cyborg in just 51 seconds to become the first-ever female fighter to hold UFC titles in two divisions. 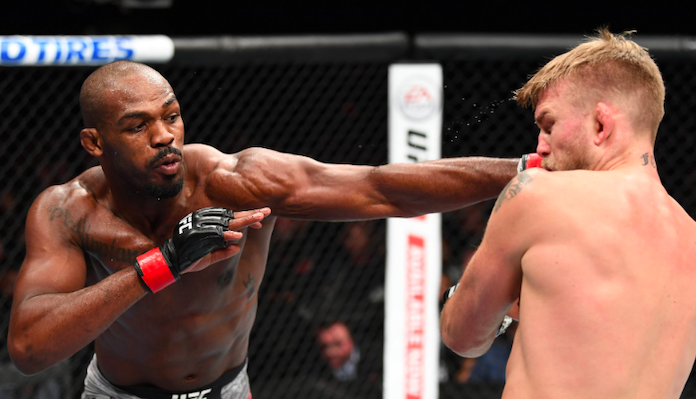 Then, in the main event, Jon Jones TKO’d Alexander Gustafsson in the third round to reclaim the light heavyweight belt. Going forward, Jones and Nunes have plenty of options in terms of who to fight next. For Cyborg, things are a little less clear, as her current UFC contract expires in the New Year. Alexander Gustafsson, finally, will have to return to the drawing board as he prepares to make another campaign toward a title shot. Here are the fights we would like to see next for the main and co-main event fighters of UFC 232. After a 15-month USADA suspension, Jon Jones is the light heavyweight champion again. With that, Jones has plenty of options for his next fight. He can stay at light heavyweight and fight a top contender like Anthony Smith or Dominick Reyes, but that’s not his only choice. He could also move up to the heavyweight to division to battle his nemesis Daniel Cormier in an effort to become a two-division champion. Jones has already bested Cormier at light heavyweight, but at heavyweight, Cormier has looked better than ever. He has even more knockout power than he did at 205, and could be a real threat to Jones. The trilogy fight is a fight the fans want to see and it could easily headline a card in March or the summer of 2019 — that is if Daniel Cormier decides to postpone his retirement. The fight would give Cormier another chance to beat his rival, while Jones would get a shot to become the next champ-champ in the UFC. It just makes too much sense to not happen. Alexander Gustafsson is now 0-3 in title fights in the UFC. Based on that fact, it will be very hard for him to get another shot, especially as long as Jon Jones remains the champion. Gustafsson needed this win for his career, but with this loss, he is in left in limbo. A fight that makes sense for Gustafsson at this stage is one with Anthony Smith. Smith arguably deserves the next title shot, however, if Jones does go and fight Cormier, he might be forced to wait. A fight with Alexander Gustafsson would help Smith cement himself as the number one contender, while it would give Gustafsson the chance to get back on track. Amanda Nunes is now a two-division UFC champion, having shocked the world with a thunderous KO of Cris Cyborg in the UFC 232 co-main event. Now, Nunes has options for her next fight. She can stay at featherweight and defend that belt, or, she can move back down to bantamweight and defend that title against one of several worthy contenders. Realistically, the next fight for Nunes should probably be a title defense at bantamweight. There are not many real challengers at featherweight, but at bantamweight, there are several challengers who Nunes has yet to beat. A fight that makes sense is one with Holly Holm if she can get past Aspen Ladd at UFC 235. If Holm doesn’t win, Nunes could also take on former featherweight champion and top bantamweight contender Germaine de Randamie. Whatever the case, she has plenty of options for her next fight. It has been well documented that Cris Cyborg has only one fight left on her deal, and that the deal expires in March. With that, Cyborg may well have fought her last fight in the UFC and may go elsewhere to continue her fighting career. She has mentioned several times that she wants to become a professional boxer, and Bellator would also probably love to have her as well. However, if Cyborg does get another fight in the UFC, it has to be a rematch against Amanda Nunes. Cyborg has been a dominant champion inside the UFC and outside, and if she gets another chance to fight Nunes, the fight could definitely go differently. Who do you want these four fighters to fight next?